Advantages: Helpfully captioned photos of some rare subjects (including two views of Gunther Rall's Bf 109F-4 "Black 1"; good coverage of popular fighter types; logically arranged by aircraft type; very attractive profiles by Tom Tullis. The second of Eagle Editions "Wings of the Black Cross" is now available. Number Two is presented inside a soft cover, with 36 glossy pages enclosed. 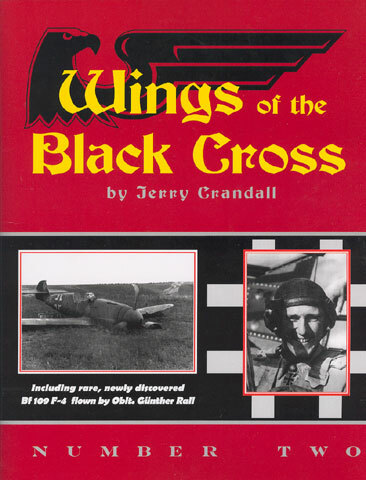 With a layout consistent with the first excellent instalment, "Wings of the Black Cross" Number Two is packed with 60 black and white wartime photos, plus two colour photos on the rear cover and eight colour profiles by Tom Tullis. Each page has two or three photos. A good selection of subjects is covered, with about half the photos depicting late model Fw 190s and Bf 109s. The Me 262, He 162, Me 163, Do 335, Bf 110, Fw 189, Ju 87G, Ar 234B and Ju 88/188 are also covered in captioned photographs. I was pleased to see a good photo of a Ju 388 and two pictures of an operational Ju 290A-7 wrapping up the main section of the book. Most of the photos of abandoned or wrecked aircraft.have been taken by servicemen. Indeed, one of these servicemen (also pictured in one of the photographs) is Master Sergeant Douglas Bell, father of well-known aviation historian Dana Bell. Most of these photos are quite close to the subject, and offer the modeller a wealth of detail on camouflage schemes, markings and airframe characteristics. Jerry Crandall's wealth of experience and knowledge is a great resource, and have been tapped via the useful captions. Many of these captions include observations about the colours and markings of the pictured aircraft. Tom Tullis' artwork is up to his usual superb standard. The seven subjects (with Rall's "Black 8" being treated to two side profiles) all appear in at least one photograph in the book. We will presumably see a decal tie-in from EagleCals some time in the future. Number Two of "Wings of the Black Cross" is a compact and helpful reference source for modellers and Luftwaffe buffs.